There’s a new band in town and probably the only one of its kind. 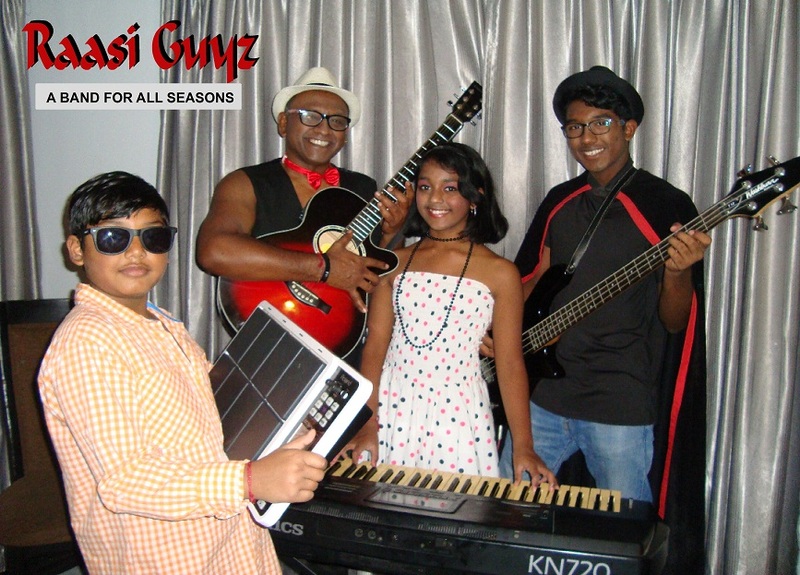 Certainly no idle bunch of dropouts looking to while away their time, Raasi Guyz are a family of five who have decided that their talents are not going to go to waste. Led by veteran entertainer and theatre practitioner, Satchu Annamalai, the band is made up of Rashawn on drums, Dayita on Keyboard, Kashvin on bass guitar, and Kavitha on percussion. Satchu plays rhythm guitar and vocals. The Raasi Guyz repertoire ranges from 80’s pop to Bollywood film and chutney and also music written by themselves. Annamalai says that the creative aspect is important to the band and therefore there is no strict adherence to cover versions. “We are definitely creating our own identity and our take on many of the old songs are therefore fresh. We place a lot of emphasis on the entertainment value so distorting the music of others is very much part of the agenda”. Rashawn is the baby of the band. While he is a trifle shy when spoken to, he is ready and eager to show what he can do on the drums. He flashes a broad grin and his whole face lights up when he is applauded for pulling off complex beats on his Roland electronic drum kit. Kavitha, who apart from carrying out her motherly duties, plays percussion and is in charge of make-up and costume. While most mothers would be too ready to brag about the family, she chooses to be quiet and let her children and spouse do all the talking. “We are not just a musical band, we are much more,” says Kashvin proudly, “We are a family acting together.” Sensing that there could be confusion, his dad continues: “We see Raasi Guyz as a vehicle for other things to happen, not only to inspire families to form bands and play music together, but to actively engage in inter-family and multi-family activity. To this end we have various family events planned; in December we invite families to partake in a cook-off in which our children are the main participants and the emphasis is on nutritious meals. In April, Raasi Guyz will host a family arts and craft exhibition and in July we are off to the Standard Bank National Arts Festival.